12 Most installed offline Android apps working without the internet: – With the advent of technology, communication between masses around the globe has gained a top-most priority. As the mobile and other devices gain importance, the development of different applications has been the need of the hour to serve the consumers in a better way. Different operating systems platforms like Android, iOS, Symbian, Windows etc. are coming up with user-friendly applications that help you to carry out your tasks in such a smooth manner that you won’t even realize the efforts. Android platform is currently leading with its some of the best offerings for applications. It provides both online and offline version of applications that can be easily installed on your device. Some applications come with a price tag, and some absolutely free of cost. Below are some of the best Android applications that are first of all free, and can also be accessed offline with minimum efforts. These applications work exceptionally well even when they are devoid of internet connection. 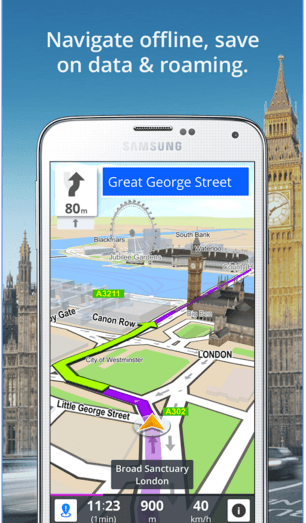 GPS Navigation and Maps from Sygic Business solutions is one of the best free offline applications available in the Android market, which reflects changing trends in the travel and navigation sector and makes your journey enjoyable. It works exceptionally well without having the need to go online. So people who often travel, and explore new places are bound to love this application. The maps and navigation directions are made available on your Android devices when you install GPS Navigation & Maps application. This Android application is available for free in the Google Play store with excellent features. It can also be updated every three months from the store, absolutely free of cost. The application provides you with offline services like free navigation, GPS, offline TomTom maps and route planning. This application has been made compatible with Android devices to work best when in offline mode. It facilitates you with intuitive voice navigation in the languages of your choice. You can also use this application when travelling abroad, as it provides you detailed routes of any international location with the help of Global Positioning System. You can easily navigate and explore pedestrian walkways. The application also supports live parking details, so as to help you park hassle-free. It facilitates you with Dynamic Lane Guidance, so that you can safely change your path without any difficulty. This application also provides voice guidance while you drive with the help of Bluetooth or cable wire, so that it’s easy for you to focus on the road and thus avoid road accidents. It comes along with three different alternatives routes to choose from, so that you can avoid tolls, and also speed up your journey. If you are lost, Automatic RE-routing feature will save you. You can save the routes too. If you want to avail high-end application features like 3D maps, real-time voice navigation with guidance on particular areas and speed limit warnings, you will have to switch from free to premium version of the GPS Navigation and Maps application. It will have some advanced features. Stuck with a new word? Want to excel in pronunciations and translations of different words? 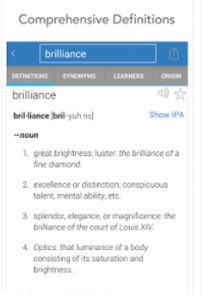 Dictionary.com application in the Android market is the sure shot solution to your problems. Dictionary.com consists of around 2000000 definitions of words and their related forms. It is one of the best free offline English dictionary application for the Android devices. The dictionary application draws its content from two leading websites Dictioanry.com and Thesaurus.com to provide solutions to your word related problems. It helps you to discover new English words and gain mastery over them in no time. Dictionary.com application facilitates with millions of definitions of words, their spellings and pronunciations with thousands of related examples. The most attractive features of the dictionary application are that it provides offline translation service and audio pronunciation. You get Word of the day and crossword puzzles as part of learning with fun initiative from the application. So that a quite learning experience! You can even browse around 800 topics related to fun facts about English language with this amazing dictionary application. It consists of different slideshows that open a new world of fascinating facts. You can also indulge in various quiz contests to check your vocab and knowledge of English. This application also allows you to see the current topics searched by other users, and thus help you learn new words. With Dictionary.com, you can also gain knowledge about different word’s origins. If you opt to buy the app, then the paid version will offer you attractive offline features like Encyclopedia, Idioms and phrases. The application will also allow you to use different dictionaries like Medical, Rhyming words and Science with the premium version of the application. Wiki Encyclopedia Gold is an amazing application that helps you dive in the vast information world even without the aid of internet connectivity. This application represents Wikipedia, an information repository inarticulate manner. Wiki Encyclopedia Gold provides you the information very easily and at high speed. This application allows you to download offline databases of the free encyclopedia i.e. Wikipedia in over 30 languages. The application helps you to set a default language of your choice to view the articles. You also have the liberty to read your favorite article in any other language too. 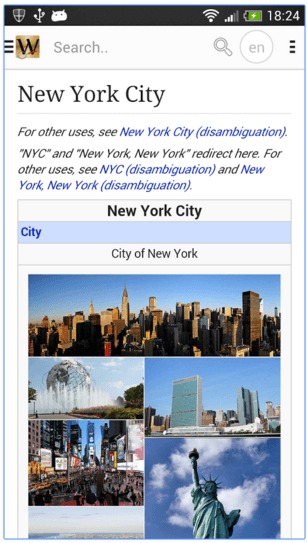 You can also switch from online and offline version of the Wikipedia Encyclopedia, and even access the online dictionary called as Wikitionary. This online dictionary facilitates with the meaning of different words in different languages with their translated version. One of the most attractive features of Wiki Encyclopedia Gold application is that you are provided with the “Articles near me” feature so as to access related meaningful articled based on your search history. You can even utilize the “Random function” option and read a totally unplanned article as compared to article on your list. Wiki Encyclopedia Gold android application is also loaded up with Day and Night mode settings to make you read the text on your Android device according to the time of the day i.e. white text on black background or Black text on white background. With Wiki Encyclopedia Gold application’s Autocomplete feature you can speed up your search for relevant articles. This application also provides you the liberty to utilize the search option on the current article you are reading. You can also save your favorite articles to the device’s memory to access it later. Want to share your files from one device to another hassle-free? ‘Share It’ application in the Android market is one of the best applications in this department, and is the fastest cross-platform file transfer application. Share It android application allows you to transfer you files between device without worrying into which category they fall in i.e. mobiles or personal computers, all in offline mode. Share It application has a very interactive user interface with excellent functionalities. It allows you to transfer content like photos, video, files and documents very easily. You have the liberty to send files ranging from 1 MB to 100 GB via Share It application. The transfer of file from one device to another is just a matter of seconds, and can be done using any operating system. Share It application possess speed 200 times more than Bluetooth application, and can transfer up to 20 MB per second. 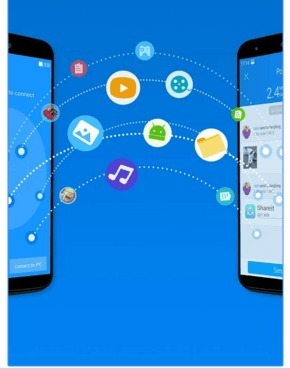 This application allows discovering various Share It users and friends via the application’s user interface and transferring files with ease. One of the most appealing features of Share It is its “Clone it” functionality. You can utilize this feature to replicate your contacts, messages (SMS and MMS), other applications, videos and other important data from your old phone to new one. 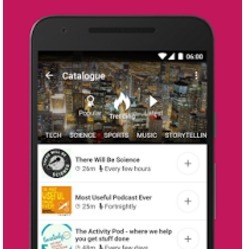 Player FM is topmost android application for listening to podcasts that caters to your podcasts interests. Player FM is an offline podcast made freely available to addicted podcasts users to access podcasts channel-wise, topic-wise or category-wise. This android application offers around 500 topics when you sign up for the application’s service. You can choose from different trending topics on the internet like a specific movie or Xbox news. This application also helps you to find shows and programs according to your taste and play them offline. The topics offered to you are not generalized but kept specific to serve you in an excellent manner. Player FM allows you to listen to the podcasts in offline mode anywhere and anytime. All you have to do is just download the podcasts to your devices directly and start listening. Player FM comes with a home screen featuring that show notes and links for other podcasts. You can also use the lock screen widget that comes free of cost with the podcast application. You also receive personal recommendations and interactive notifications for podcasts based on your search history. 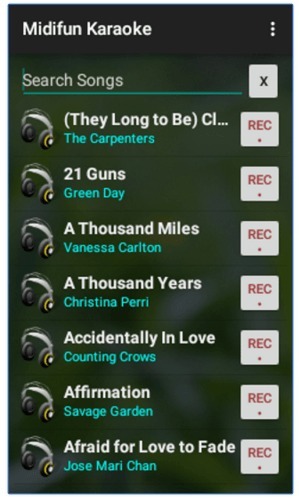 Player FM guides you to undiscovered interesting podcasts, and makes your experience enjoyable. The application also consists of functionalities like speed control, auto-cleanup and sleep timer, which are highly manageable at any point of time. You also have the liberty to pause your podcasts and resume anytime just from where you left. Player FM allows you to listen to your favorite podcasts in almost 50 languages, and thus also helping you to learn a new language if you want to. You can also launch various TV shows with the help of Android wear like Smart watch. You can opt for Gold membership plan where the service offering will also include podcasts sync and browsing history. Midifun Karaoke is the best Android application for showing your Karaoke skills. You just have to install this application from the Google play store, and hundreds of songs are placed at your disposal. Midifun Karaoke is a musical instrument digital interface, provided to you with lyrics of different songs to make your time enjoyable. The application comes free of cost, and can be utilized in offline mode after downloading. You can also request for addition of a new song from the developers and support team. The application allows you to access lyrics of different songs offline, and sing out your heart. Midifun Karaoke also provides you a “Guess the song” game. The lyrics will be hummed or displayed on the screen, and all you need is to guess the song from the lyrics. You can even earn bonus points if you guess the song in less time. The karaoke application also lets you record the song you have sung using the application and then replay it later. Currency Converter is the best conversion tool available in the Android market for all the businessmen out there. This application tracks the changing trends related to money in the international markets, and aids in converting the money accordingly. Currency Converter is also a very helpful tool for the traders around the globe to keep a track of the currency news. The most attractive feature of the Currency Converter is that it is accessible even in the offline mode. It helps you to get the most recent currencies conversion rate all over the world. Currency Converter performs the conversion of almost 15 foreign currencies at a time. 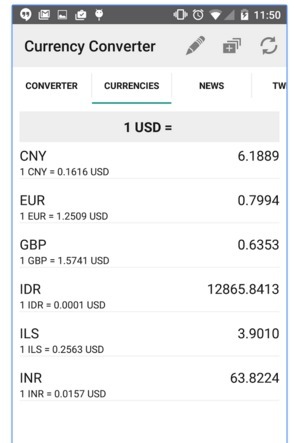 This currency conversion application also represents the current and past exchange rates lists with related historical data in the form of graphs and charts. You even have the freedom to add a new currency in the application. All you have to do is add the new currency code and run the update. The application will automatically download the name of the currency, and the applicable exchange rate into its database. Currency Conversion also provides the exchange rates of precious metals. The latest update for the application includes translations in Brazilian, Polish, Korean, Italian, Portuguese and French languages. Even the latest Android wear devices feature this application on them so that it can be accessed very easily. Pocket from Android OS is a very convenient application, which makes your tasks easy. If you are high on reading and surfing web, then this quick and handy application has great usage with unlimited storage option for you. With Pocket, you gain the liberty of saving your preferred reading material or videos to watch them at free time by not just saving links but the complete article. You also have the freedom to access the article even when offline. 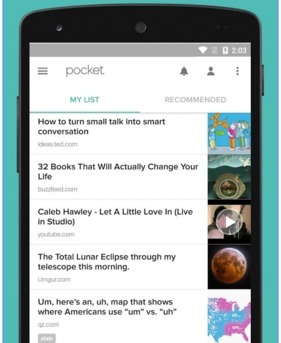 Pocket helps you to search and save some of the best articles on the web. This application also provides personal recommendations on most interesting articles around the globe based on your browsing history. The articles you are currently reading or saved for future will also be recommended to your friends and followers. If you have Pocket application on all your Android devices like mobile phone, tablet or even computers, the saved article on one device will be synced, and made accessible through other devices also. Pocket has a very user friendly interface with lot of customizing and personalizing option, which guarantees you get an amazing reading experience. The application has easy-to-view layout which is completely add-free. The application provides you the functionality of tags and bookmarks so that you can properly organize your articles and also start reading from the place where you left. Pocket also has an amazing feature of “Text-to-Speech”, with which you can comfortably listen to your favorite stories. This is by far the best application with the help of which you can read your favorite articles anywhere, anytime without depending on the internet connectivity. World Travel Guide by Triposo is one of the best free applications in the travel category, and makes you addicted to this wonderful application in no time. The application comes with handy maps of different locations, which make your journey even more hassle-free. The application is definitely the one you must have on your phone when you are visiting other cities in your home country or international destinations. It works best even if you are offline with no internet connectivity. One of the most attractive features of this application is that it self-starts, and auto suggests according to your current location. World Travel Guide provides you recommendations based on your current location. It will suggest you nearby places to visit with their exact navigational routes. You can even download an interactive travel guide for the city of your choice or even the guide for whole country and access information even when offline. The guide facilitates information like must-see places list, great restaurants for the food-lovers with ample nightlife options, local wildlife, festivals, culture and many more. World Travel guide also acts like a weather forecaster and news reporter for the city you are visiting, keeping you updated all the time. These features require an internet connection to access the latest updates with no roaming charges. It will also perform the currency conversion tasks for you, if you are abroad. It consists of Phrasebooks that explains the meaning of particular words and phrases easily at International locations. The latest updates for World Travel Guide includes option for viewing different images of a particular place with access to internet connection. The application also provides you with the shortcuts routes on any city so that you can minimize the travel time. The latest update also includes updated hotel maps with price tags of different hotels in areas of your choice. Medscape app designed for physicians and medical students is the best free application for healthcare professionals with around 4 million registered users. 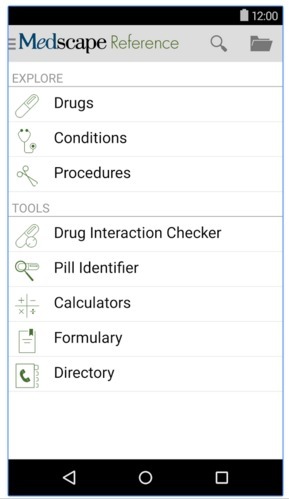 The features of the application like medical news, disease information, diagnosis methods, medical calculators, drug formulation information and medical education courses are all available free of cost, once you download and sign up for the application. Some of the features are also accessible offline like health condition, drug information, interaction checker and procedure reference, when you download the clinical reference database provided by Medscape. With this application you get access to latest medical news covering around more than 30 specialties, conference news with some of the most recent and important journal articles. You can scan through drug information, and also get health plan formulary information with the help of Medscape application. Medscape also suggests treatment on the basis of diagnosis information feeds from your side. It consists of information of around 4400 plus diseases, their symptoms and conditions thereafter, which has been reviewed by expert physicians. Medscape also lets you access medical calculators to calculate the dose of particular drugs and covers various scales, formulas and classifications. For more serious people into this domain, they can even opt for accredited CME/CE courses to acquire license as medical practitioner, and thus carry on with your professional development. Medscape also allows you scan though current drug lists. This application suggests you preferred reading articles based on your browsing history. Wattpad – Free Books & Stories is a unique platform for you to read stories and books written and published by budding authors. If you want to read stories which have totally new perspective with unique storyline, then Wattpad is the application you would want to indulge in. You can search books of different genres like romance, non-fiction, mystery, travelogues, memes, fan fiction, etc. and different topics as per your interest. You can also search for stories of your favorite celebrities by their names. One of the most unique features of this application is that you can read different stories as they are written chapter-wise by the authors. Wattpad also provides you the freedom to connect with authors and other application users to share your views and comments with them. This application allows you to download books and stories, so that you can read them while in offline mode in a very friendly user interface. You can thus create a library of stories of your choice and also share the same with your friends on Wattpad. You can also write your own stories and publish them on the application to get reviews and comments. 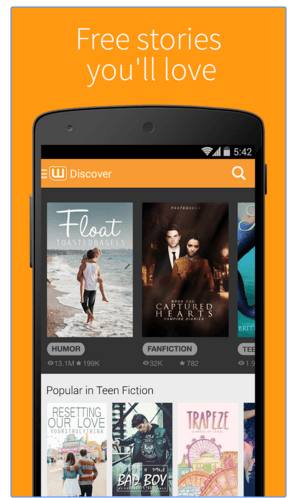 Wattpad also gives you personalized recommendation of different stories and books depending on you reading history. GF Offline Translator is the most loved and popular application in the Android community because of its easy to use offline translation features. This application can translate one of the 14 languages i.e. English, French, German, Hindi, Italian, Japanese, Bulgarian, Catalan, Chinese, Dutch, Finnish, Spanish, Swedish and Thai, even when in offline mode. The application also consists of grammar dictionaries for different languages, so as to avoid any errors while translating. The application uses color indicators to depict the confidence of the translation. It uses green color to reflect that the translation is correct semantically i.e. words and phrases have been translated correctly. 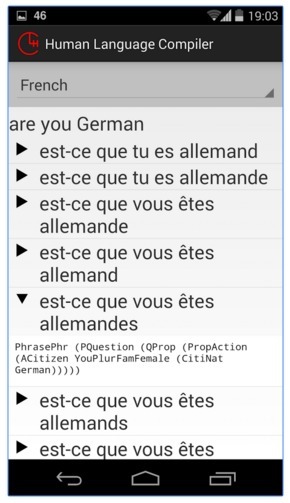 The application uses yellow color to reflect that the translated version is grammatically correct. Light red color reflects that you need to change the format of sentences and again retry, while Dark red indicates that the word-by-word-translation is defective and you may have to check the sentences you want to translate. GF Offline translator provides translation of both speech and text inputs from your side. You can easily translate SMS messages or audio files received with the help of this application.